Are you longing for relief from arthritic pains, anxiety, or even the common cold? Come and experience our Tibetan Foot Soak therapy! 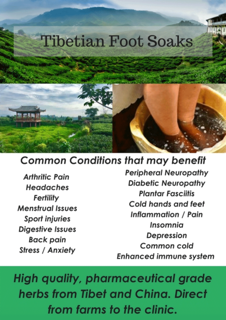 This therapy is made from high quality, pharmaceutical grade herbs grown only in Tibet and China. We directly import them from the farms to our clinic so you get the exclusive treatment from us at our therapy center. These herbs are then prepared by expert herbalists to be mixed in hot water, just enough to be ready for the soaking therapy. The purpose of the therapy is to enhance blood circulation starting from the feet so that the therapeutic elements of the herbs are absorbed in the body. The length of time in soaking the patient’s feet depends on the person’s specific condition. For those who have general health conditions, they can soak for approximately 30 minutes. Those with more serious health issues need to soak for up to 45 minutes. Tibetan Foot Soak is able to help alleviate pains not just with arthritis, anxiety, and colds, but it also provides comfort for headaches, sports injuries, digestive problems, insomnia, and diabetes, among others. However, it doesn’t just provide therapy for physical complaints. In your Tibetan Foot Soak sessions, you have to be settled comfortably on a chair, away from the distractions of TV and mobile phones. It’s a chance for you to just enjoy the moment. Thus, you will be given the relaxing experience that calms not just your body, but your moods as well. To give you a fulfilling Tibetan Foot Soak therapy experience, visit us at Presence of Wellness. Book your appointment today so you can have something fulfilling to look forward to. For inquiries, don’t hesitate to contact us.